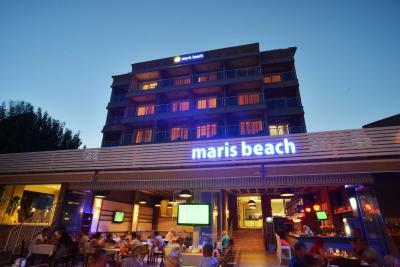 Lock in a great price for Maris Beach Hotel – rated 8 by recent guests! 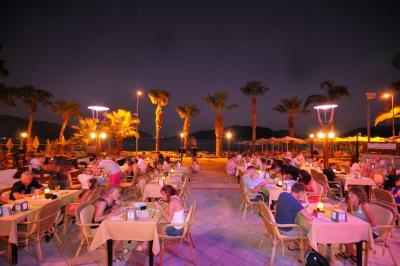 I love that it's right on the beach and staff very helpful and friendly. 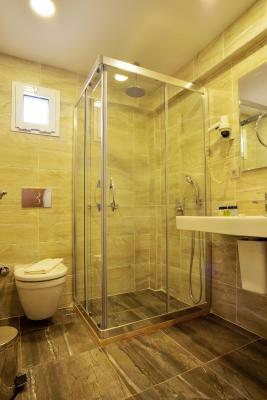 Perfect location, excellent cleaning with new towels and sheets anytime you wished. Breakfast was nice but a bit limited. 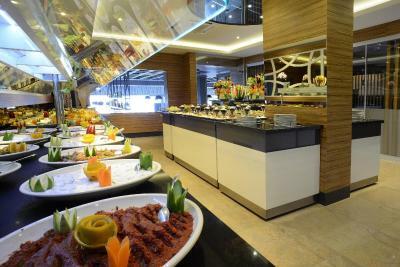 Nice restaurant with lovely food. 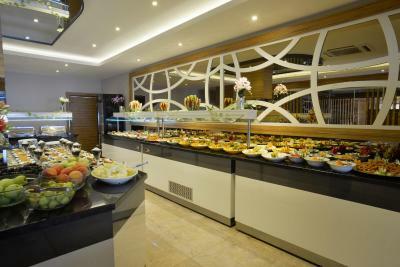 All staff in the restaurant were very polite and helpful. 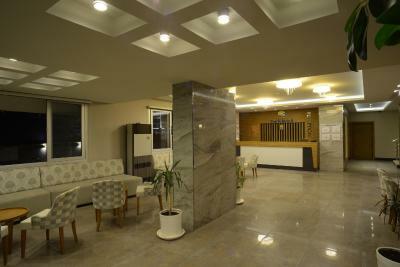 This is a small, friendly and very clean hotel. Good choice at breakfast and the restaurant is excellent. 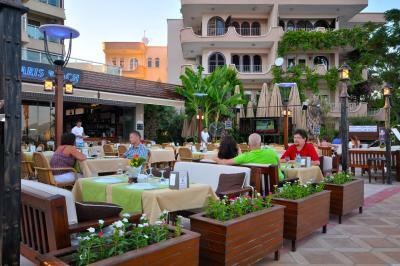 The staff were wonderful,great bedrooms,good bar and restaurant,lovely loungers. The view is Amazing from the balcony. Room is really good and we sleep well in our beds. 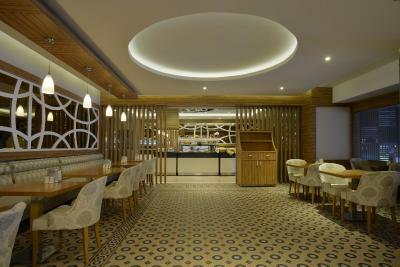 Maris Beach Hotel This rating is a reflection of how the property compares to the industry standard when it comes to price, facilities and services available. It's based on a self-evaluation by the property. Use this rating to help choose your stay! 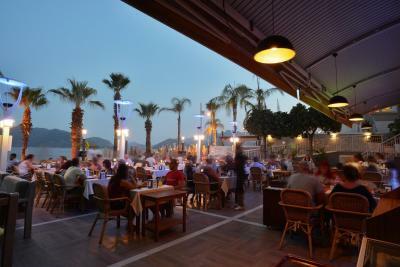 One of our top picks in Marmaris.Located on a private beach in Marmaris, Maris Beach Hotel offers rooms with free Wi-Fi and a balcony. 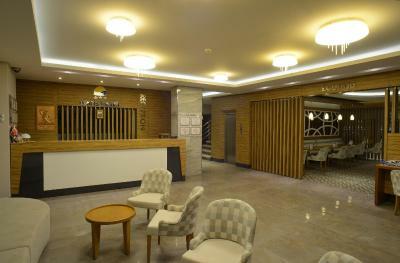 Facilities include an outdoor swimming pool with a sun terrace. 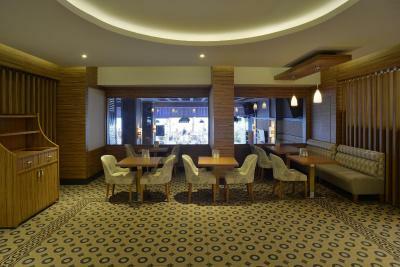 The air-conditioned rooms at Maris Beach are decorated with warm colors, wooden furniture, and floor-to-ceiling windows. 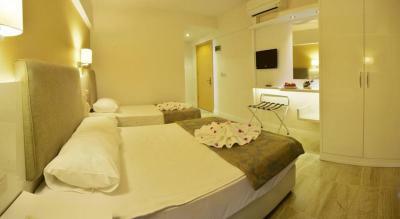 All rooms have a mini-bar, satellite TV, and an private bathroom. 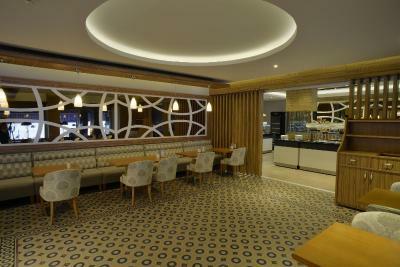 The restaurant of Maris Beach Hotel serves Mediterranean dishes as well as international cuisine. 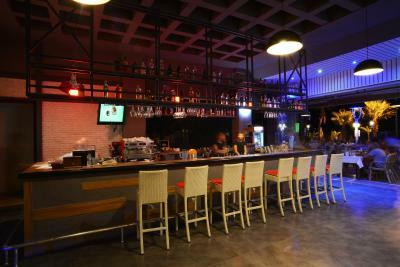 The bar offers refreshing drinks and snacks. 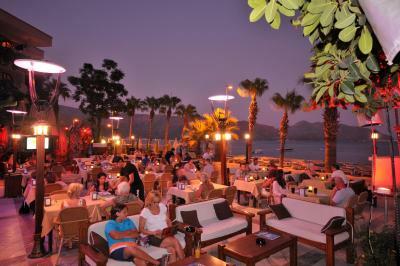 The 24-hour reception can help arrange trips to the main sights of Marmaris. 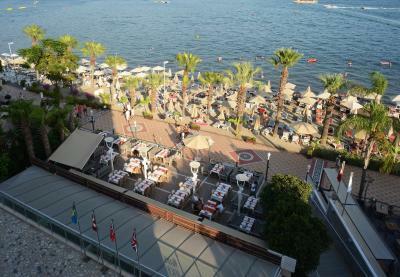 Maris Beach Hotel also offers bicycle and car rental. 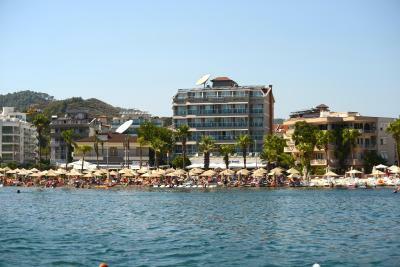 Maris Beach Hotel is 1.2 mi from the center of Marmaris, and 1.6 mi from Marmaris Castle and the marina. Free parking is available nearby. 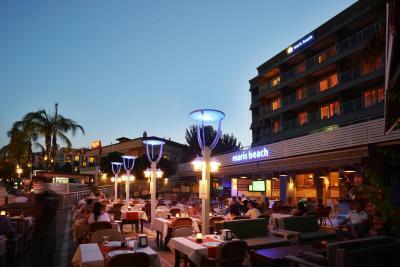 When would you like to stay at Maris Beach Hotel? 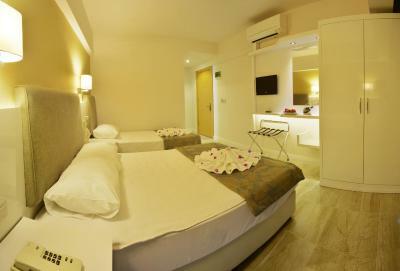 Air-conditioned room with a satellite TV and a minibar. 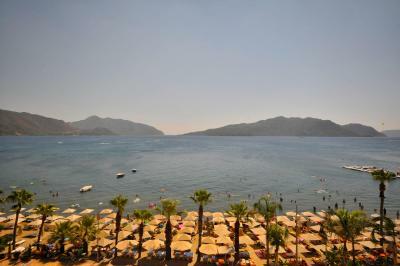 Situated on a private beach in Marmaris, Maris Beach Hotel offers rooms with free Wi-Fi and a balcony. 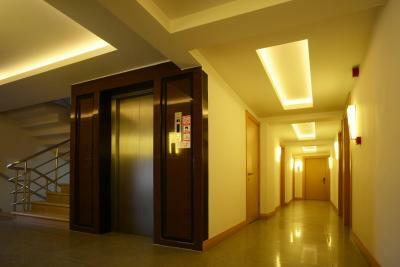 Facilities include an outdoor swimming pool with a sun terrace. 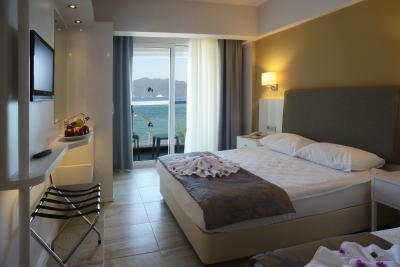 The air-conditioned rooms at Maris Beach are decorated with warm colours, wooden furniture, and floor-to-ceiling windows. 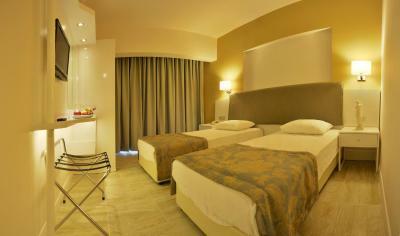 All rooms have a minibar, satellite TV, shower&WC . 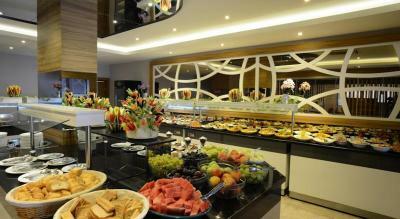 Our Restaurant serves Mediterranean dishes as well as international cuisine. 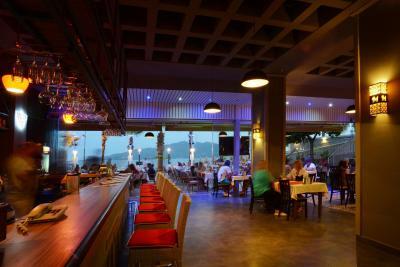 The Beach Bar offers refreshing drinks and snacks. 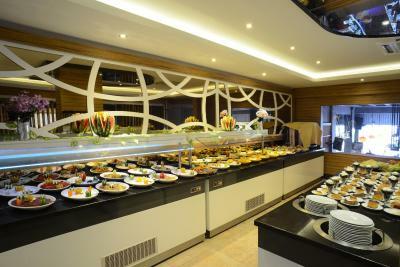 The 24-hour reception can help arrange trips to the main sights of Marmaris. 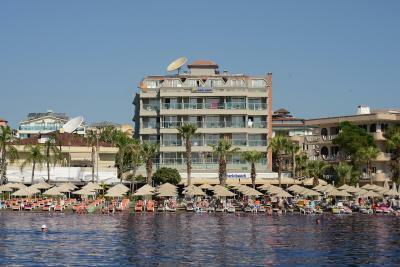 Maris Beach Hotel also offers bicycle and car rental. Maris Beach Hotel is 5 minutes from the centre of Marmaris, and 7 minutes from Marmaris Castle and the Marina. Free parking is available nearby. 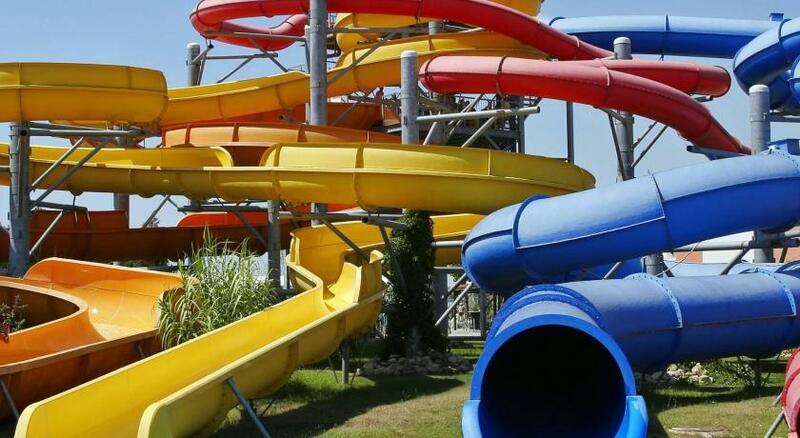 House Rules Maris Beach Hotel takes special requests – add in the next step! 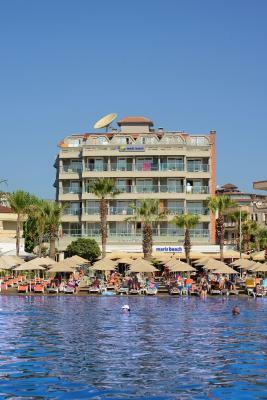 Maris Beach Hotel accepts these cards and reserves the right to temporarily hold an amount prior to arrival. Not all staff in the reception spoke english. There was also a problem with my check out; as I was leaving in the middle of the night I checked out and paid all in the afternoon. I especially asked if all was paid and ok, and the girl in the reception said yes. 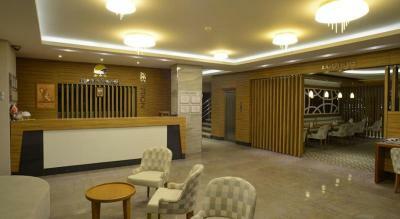 Later when I was leaving for my tranfer the hotel manager told me I hadn´t paid my bill and we had an argument. I found it very odd that I had to pay for what I took in the minibar twice, both in the afternoon and then again when I left (I hadn´t taken anything else from the minibar the last 3 days, as ot was not even once refilled during one whole week). As I was in a rush and couldn´t prove anything I just paid and left, but I told the manager that he shouln´t have reception staff that don´t speak proper english and who can´t manage to do their job correctly. That wasn´t a good ending of my holiday. Can be noisy if to take room with seaview, but the views are amazing! 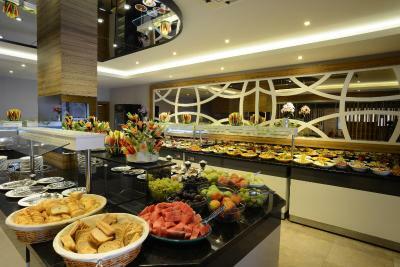 It is first sea line, private beach, good breakfast and dinner, tasty food in a restaurant. Room is clean and bathroom is new. 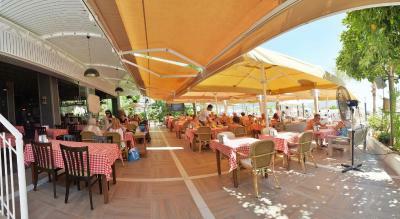 Good service on the beach, not far from the city center, many cafes and bars on the promenade road. 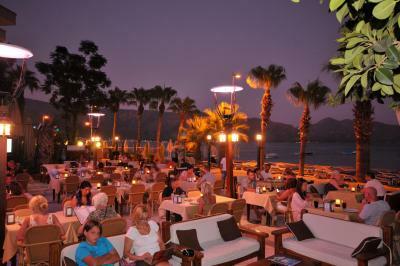 Really good playlist music on the Bamos beach! 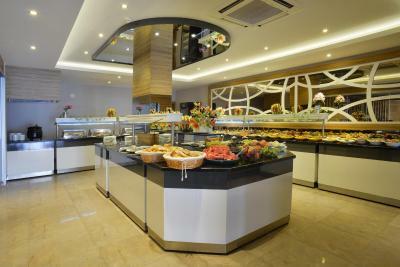 10% discount for food for the hotel guests. This is very minor - if I stayed here again I would take a mug for breakfast coffee as a small cup needs refilling too often!